A recent conversation with a potential client reminded me of one of the main reasons businesses fail when they embark on a project to increase the leads or enquiries they get from their website. In this post, I'll outline those reasons and show you how not to fall into the same trap. By all means, paint the picture in your mind of the perfect world outcome of your SEO project. Imagine the fantastic highly targeted traffic you'll get sending visitors to your website looking to buy what you sell. You can also imagine the impact all this will have on your profits. Visualising this is healthy, a good thing. Incidentally, if you're not clear about what SEO is our SEO primer will help. It's also fine to consider the tactics you might employ to achieve these goals. The keyword research to establish what you need to rank for, the content generation you'll need to do, such as blogging, to chase those rankings and so on. It's all good, it's great to see the big picture. The challenge is if you don't develop a strategy to guide your activities you're going to fail no matter how much time and money you throw at it. Successful businesses succeed because they have a strategy. Furthermore, smart businesses inform their strategies with data and facts to make informed strategic decisions. This approach is also vital if you want your web-based lead generation project to succeed, without a guiding policy or strategy you will flounder and fail, guaranteed. So back to that conversation with the potential client I mentioned in the opening paragraph of this post. They didn't want to create a strategy, they simply wanted to know how many blog posts we'd write and how many links we'd get them. In short, they didn't want to invest in a strategy. One of the most compelling reasons to take a strategic approach to your web-based lead gen project is the abundance of fantastic information available to inform your strategy. You don't need to guess what people search for, you don't need to guess how your competitors are ranking, and you don't need to guess how challenging or otherwise achieving your goals is going to be. All of these things you can know and by knowing them you can create a fully informed process deploying the right tactics in the right way. What Should A Strategy Look Like? 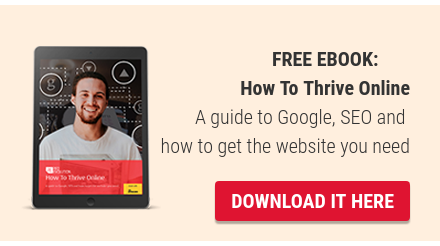 A well-structured strategy to secure traffic from Google™ is different for all organisations. There are however some guiding policies that most marketing managers should follow, policies that will help you decide where to play and how to win. Develop profiles of your ideal customers, these are often called buyer personas. Make sure you understand their major pain points, the problems they are trying to solve when searching on Google. Understand what type of content your ideal customers like to consume. Understand what search terms your ideal customers use when searching. Look at the pages currently ranking for these search terms and decide how difficult it's going to be to out-rank them. Establish what resources are going to be required to deliver the strategy. Put in place metrics that will measure your progress. Use data to modify your tactics until you find the sweet spot. Keep looking for sweeter spots! If you adopt these broad guidelines you will be head and shoulders above your competitors. Take it from us, most of them are not doing this stuff. Based on the information in this post you should now recognise the importance of taking a strategic approach to using your website to find new customers. We haven't looked at the whole picture, for example, the sales funnel, lead nurturing and a sales process that complements all of the hard traffic generation work, but the above is a solid start. If you're still a little confused a FREE Online Marketing Audit might help get you moving in the right direction.